To couple or uncouple quickly a hydraulic circuit. From 4 to 50 mm inside diameter. Connecting diameters ; 1/8" to 2". Threads : Gas, NPT, metric. 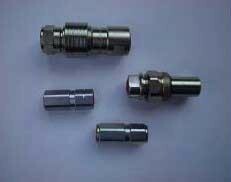 Check-valves, couplings for coolant liquids.